Apple Watch Series 4: Beautifully redesigned with breakthrough communication, fitness and health capabilities<br/>Featuring a Stunning New Display, Electrocardiogram and Fall Detection<br/>Cupertino, California — Apple today introduced <a href="https://www.apple.com/apple-watch-series-4/" target="_blank">Apple Watch Series 4</a>, redesigned and re-engineered to help users stay connected, be more active and manage their health in powerful new ways. While retaining the original iconic design, the fourth-generation Apple Watch has been refined, combining new hardware and software enhancements into a genuinely singular, unified form. The stunning display is over 30 percent larger and seamlessly integrates into the thinner, smaller case, while the new interface provides more information with richer detail. Apple Watch Series 4 with watchOS 5 brings advanced activity and communications features, along with revolutionary health capabilities, including a new accelerometer and gyroscope, which are able to detect hard falls, and an electrical heart rate sensor that can take an electrocardiogram (ECG)<sup> </sup>using the new ECG app,<sup>1</sup> which has been granted a De Novo classification by the FDA. <br/>Beginning Friday, September 14, Apple Watch Series 4 (GPS) will be available to order in 26 countries and territories and Apple Watch Series 4 (GPS + Cellular) will be available to order in 16 countries and territories. Both models will be available in stores beginning Friday, September 21. <br/>The back of Apple Watch Series 4 is composed of a gorgeous black ceramic and sapphire crystal, allowing radio waves to easily pass through the front and back for better cellular service. The Digital Crown now includes haptic feedback, offering a more mechanical and responsive feel through the sensation of incremental clicks. <br/>Apple Watch Series 4 enables customers to take an ECG reading right from the wrist using the new ECG app, which takes advantage of the electrodes built into the Digital Crown and new electrical heart rate sensor in the back crystal. With the app, users touch the Digital Crown and after 30 seconds, receive a heart rhythm classification. It can classify if the heart is beating in a normal pattern or whether there are signs of Atrial Fibrillation (AFib), a heart condition that could lead to major health complications. All recordings, their associated classifications and any noted symptoms are stored in the Health app in a PDF that can be shared with physicians. <br/>With watchOS 5, Apple Watch intermittently analyzes heart rhythms in the background and sends a notification if an irregular heart rhythm such as AFib is detected.<sup>3 </sup> It can also alert the user if the heart rate exceeds or falls below a specified threshold. <br/>Fall detection utilizes a next-generation accelerometer and gyroscope, which measures up to 32 g-forces, along with custom algorithms to identify when hard falls occur. By analyzing wrist trajectory and impact acceleration, Apple Watch sends the user an alert after a fall, which can be dismissed or used to initiate a call to emergency services. If Apple Watch senses immobility for 60 seconds after the notification, it will automatically call emergency services and send a message along with location to emergency contacts. <br/>With watchOS 5, Apple Watch becomes an even better fitness and workout companion. Activity competitions allow users to challenge other Apple Watch wearers, automatic workout detection provides an alert to start a workout while giving retroactive credit, and Yoga and Hiking are new dedicated workout types that accurately track active calories burned and exercise minutes earned. Running enthusiasts can take advantage of extended battery life — which is increased to six hours — for outdoor workouts and enjoy high-performance features, including cadence for indoor and outdoor runs, pace alerts for outdoor runs and rolling mile pace, which shows pace for the immediately preceding mile. <br/>Customers can reach their friends with just a tap of the wrist with Walkie-Talkie, a watch-to-watch connection that is an entirely new way to communicate around the world over Wi-Fi or cellular.<sup>4</sup> The Siri watch face is more predictive and proactive, offering shortcuts and actionable content from favorite third-party apps. watchOS 5 also lets users listen to their favorite podcasts on the go with Apple Podcasts on Apple Watch, and stream any podcast in the catalog by using Siri. With Apple Watch Series 4, enriched complications offer a more detailed view of helpful third-party apps like Dexcom, which allows for continuous glucose monitoring, or Streaks, which shows daily progress on tasks. 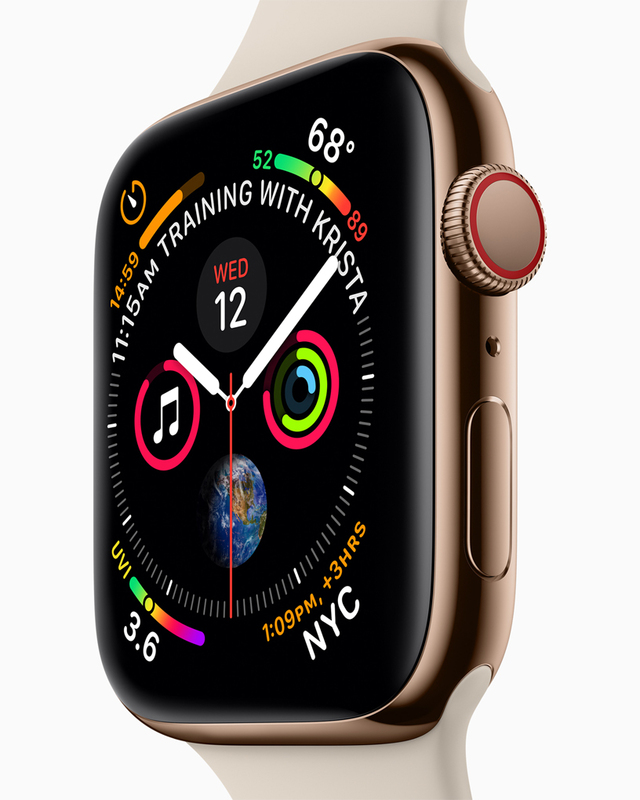 <br/>Apple Watch Series 4 (GPS) starts at<strong> $399</strong> (US) and Apple Watch Series 4 (GPS + Cellular) starts at <strong>$499</strong>, both featuring the updated design and new health features. Series 3 will be available at the new starting price of <strong>$279</strong>, making it even more accessible to customers. Along with the three aluminum finishes anodized in silver, gold and space gray, Apple Watch Series 4 now comes in a striking gold stainless steel with matching Milanese band, joining the silver and space black stainless steel models. A new collection of bands debut for fall and all bands continue to work with any generation of Apple Watch. <br/>Apple Watch Nike+ remains a customer favorite and the new collection features redesigned Nike watch faces, which match to the new band colors, including a Pure Platinum/Black Sport Band and a Summit White Sport Loop with reflective yarn. Apple Watch Hermès introduces an elegant assortment of color-blocked bands and exclusive watch faces that shift from one color to the other with the passage of the minute hand.